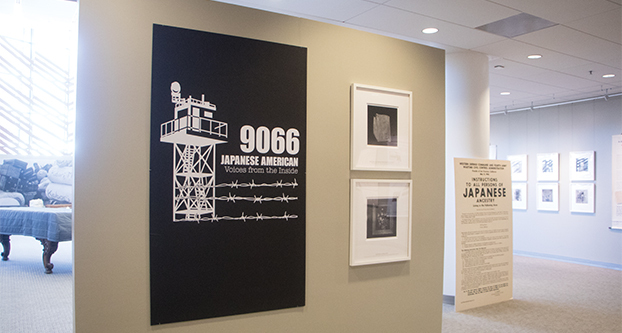 Graphics of barbed wire and “Executive Order 9066” decorate the elevators, display cases and Leon S. Peters Ellipse Gallery in the Henry Madden Library. This exhibition is part of the library’s “9066: Japanese American Voices from the Inside,” which includes several displays of events related to the 75th anniversary of the signing of Executive Order 9066 that led to the internment of Japanese Americans. In 1942, President Franklin D. Roosevelt issued the order mandating racial discrimination against Japanese Americans and their forced internment in government-run camps. Rebecca Reid-Johansson, who works in maps and government information in the library and helped set up the display, said that not everyone knows about this period in history. Roosevelt signed the order about 10 weeks after Japan attacked American forces at Pearl Harbor, plunging the United States into World War II in the Pacific. Roosevelt and his advisers were suspicious of those who were of Japanese descent, believing they could be spies or saboteurs. The government’s response was an executive order that created internment camps in many parts of the country. Families were separated. Living conditions were harsh. Roosevelt allowed those who were interned to be released in 1944. Years later, the Commission on Wartime Relocation and Internment of Civilians was founded, which was composed of individuals who studied Executive Order 9066. They found the order to be unjustifiable. The display’s glass cases at the library are filled with DVDs and books on the internment camps. There is also a map that shows where the camps were located, including the one in Fresno. 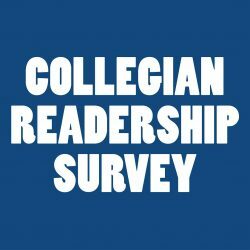 One of the books displayed is “Nisei Linguists: Japanese Americans in the Military Intelligence Service During World War II” by James C. McNaughton. It’s about Japanese soldiers who worked as translators for the U.S. Army Military Intelligence Service during the war. “A lot of Japanese Americans wanted to prove their loyalty, so many of them – for World War II – joined the military service,” said Olivia Estrada, who works in digital services and information technology in the library and helped set up the display. Estrada also said she feels that the internment of Japanese Americans relates to current politics.